She’s 8 moths old. Born in India. She has a dislocated rear left hip. It’s fully out of the socket. 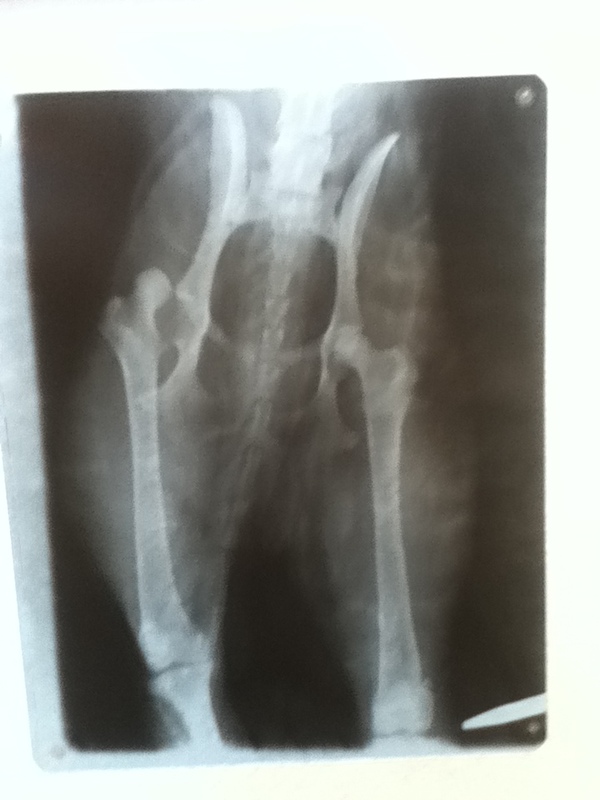 her hip is very much out of socket, and it has to stay there! Her owner was an alcoholic. Her owner beat his dogs. Her owner never fed his dogs. When i first saw Lili she was tiny, skin and bone is an accurate description. She had been kidnapped the week before by Mr Atul from The Goan Animal rescue. Mr Atul is a very good at his job. She was brought to us for fostering. Dangerously underweight and severely injured. We fed her. gave her a place to sleep, gave her medication. got an x-ray, got vaccinations. Lili’s been with me now for 3 weeks. She is happy. She is good. She has a limp. As i type, It’s 8pm in Goa, India. Lili is sat with me in the front porch. Lili has been saved. I will do my best to ensure her life is better from now on. God Bless you for saving this Precious little dog! Just love this post! I’m a NEW FAN! Thank you Catherine, I wasn’t going to write about her today, i had another inspiration for this daily prompt, bad unfortunately my german shepherd (back in England) developed aggressive Lymphoma in the past few days. The people who are looking after her for me are doing the very best job, but sadly it doesn’t look good. so i wrote this post as homage to Sheeba. The best dog I’ve ever had, and sadly i cant be there for her now she’s on her last days. So sorry to here 😦 I do understand, we are Cat lovers, and when we had to Relocate from our home State or Oregon to here in Arizona for my husbands job, I had to give my 2 babies (Cats) to friends to care for them. IT BROKE my heart…..I cried for days. We had my Buttons for 11years, Callie for 2yrs. Rescue animals, in my experience, turn into the most loyal, friendly and happy animals. All mine have come from rescue centres. Theres some kind of respect you get from a dog that is re-homed. I’m sure that having a pet from puppy or kitten is just as bond-forming. In a different way though. I will always favour the under-dog in this situation. – My sheeba spent 6 years in a German shepherd Rescue centre, from a new born puppy. No-one in six years homed her. Incredible When you meet her now and see how obedient and loyal she is..